Turkey’s President Erdogan used his mercenary Army to fight against the Syrian government military forces for the purpose of regime change. This military project of regime change in Syria was devised, supported and established by the United States of America, who is a close ally of Turkey, and fellow NATO member. “This is a memo that describes how we’re going to take out seven countries in five years, starting with Iraq, and then Syria, Lebanon, Libya, Somalia, Sudan and, finishing off, Iran.” General Wesley Clark, interview with “Democracy Now” dated 2007. Pres. Erdogan’s mercenary Army are all Chinese citizens of the far Western region in China, and home of the Uygur people, and are Sunni Muslims. The Uygur people are an ethnic group of Muslims living near the far west frontier of China and they speak the ancient Turkic language, which is the root of the modern Turkish language now spoken in Turkey. Their province is Xinjiang, and their capital city is Urumqi. For many years, Pres. Erdogan has supported the Uygur’s claims of oppression by the Chinese government. Pres. Erdogan has made speeches in which he compared the Uygur people to the ancestors of the people of Turkey. Pres. Erdogan feels there is a close historical and ethnical tie between modern Turkey and the Uygur people. In a speech, President Recep Tayyip Erdogan stated that “Eastern Turkestan is not only the home of the Turkic peoples, but it is also the cradle of Turkic history, civilization, and culture. The martyrs of Eastern Turkestan are our own martyrs.” His designation of Eastern Turkestan is actually the Chinese province of Xinjiang, the home of the Uygur people. Pres. Erdogan used his own mercenary Army of Chinese citizens: the Uygurs. He had allowed them Turkish passports, which they used to pass legally through Central Asia to arrive in Turkey. The immigration officials at the airport in Turkey recognized these special passports, and would confiscate them, but allow the Chinese to pass through legally and enter Turkey. Pres. Erdogan had arranged for them to be transported from the airport in Turkey into Syria through the large and porous border area North of Idlib, which was once a mid-size town in North West Syria. In the Zeytinburnu distict of Istanbul, Nurali T., a Uyghur Turk working to transport terrorists into Syria, with implicit allowance of the Turkish government, and especially the Turkish Intelligence Services, provides militants with passports worldwide. According to Nurali T.’s office manager, “More than 50,000 Uyghur Turks came to Turkey with these fake passports from China via Thailand and Malaysia and entered Syria after staying a day in Istanbul”. Militants who entered Turkey with these fake passports are hosted either in hotels or guesthouses for a day before they pass into Syria through the borders which are under terrorist control. Idlib was a hot-spot of violence and destruction from the early months of the Syrian crisis, which started in March 2011. By late summer of 2011, Idlib was almost empty of residents, who either fled to Turkish refugee camps nearby, or fled to the refugee camps of Latakia. Idlib transformed into a Free Syrian Army headquarters and base of operations. When Republican Senator John McCain of Arizona made his famous illegal trip into Syria, to meet the FSA commanders, he was near Idlib. Eventually, the FSA recruited and invited Al Qaeda from Libya, Afghanistan, Chechnya, and other Arab and Western countries, such as USA, UK, Europe and Australia. The majority of Syrian residents do not support armed revolution, or the armed opposition called FSA. Because of this lack of support on the ground, the FSA chose to call in their Jihadi brothers globally, or face defeat. The American CIA office in Adana, Turkey, who runs the FSA command and supplies headquarters, had no problem in allowing the Al Qaeda and their affiliates to bolster the ground forces of the FSA, who had been dwindling. America used the Free Syrian Army (FSA), and Al Qaeda affiliates: Jibhat al Nusra, Islamic Army, Nour al Deen al Zinki and Ahrar al Sham, to fight the Syrian government forces, thus avoiding American “boots on the ground”. In fact, the FSA and all the other armed militias are acting as American “boots on the ground”: as mercenaries. Today ISIS-inspired radicals in Europe repeat the experience of TIP fighters, who massacred Han Chinese at stations in Kunming and Guangzhou using knives, axes, and machetes in 2014. The TIP has a long history of terrorist attacks inside China, targeting Chinese people who are not Muslim. Now that TIP is in Syria in large numbers, they have become a serious contender in global Jihad. In October 2013, five died when a car crashed into a group of pedestrians near Tiananmen Square in Beijing, and TIP claimed responsibility for the attack in a video. This act reminds us of the Nice, France truck attack which killed and injured a large number of pedestrians in summer 2016. The TIP terrorists in Idlib took great pride in destroying the several Christian Churches of the area. As in many parts of Syria, the Idlib area had been home to Muslims, Christians and minority sects. The TIP made many videos of the destruction of Churches and placing their TIP flag on the steeple of the Churches. The Uygurs are in general a poor and under educated group in China. They have a strong sense of family ties, and some have felt a political alienation from the Chinese government and society. Because of that, most of the Uygurs who migrated to Idlib, Syria brought their entire families with them. The married males: their wife, their children and their elderly parents. This is unlike most Jihadists, who are young males traveling alone. Because these Jihadists of the TIP had arrived in Idlib, Syria as whole family units, they needed special living arrangements, unlike the male-only typical terrorist camps. The TIP occupied a whole village in the Idlib province named Az-Zanbaqi, which is now home to 3,500 Uygurs of all ages and sexes. There were so many children with them, that they established their own schools there. The children are mainly taught the Koran and military training, like ‘Junior Jihadis’. 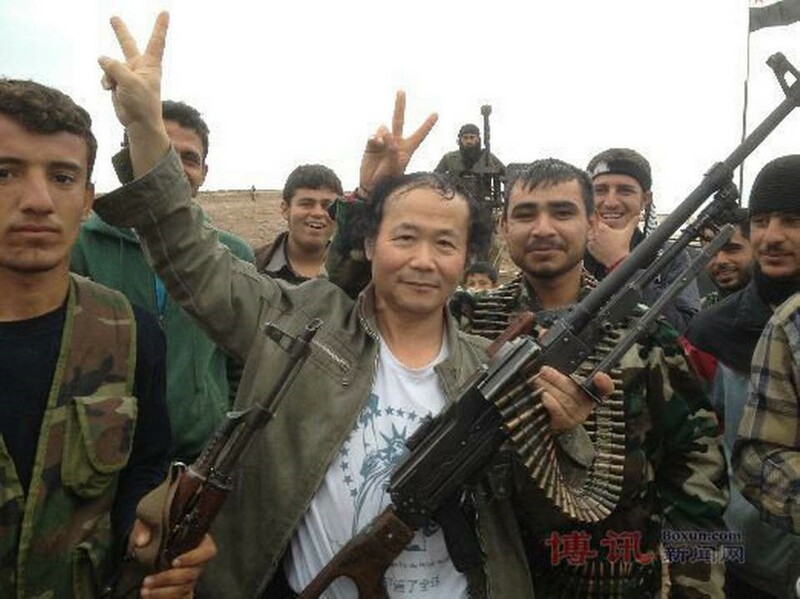 Their dream is to survive the Syrian Jihad, and grow up well trained in terrorist fighting, then make their way back to China and begin their attack on China, to transform China into an Islamic State. The Saudi Arabian and Qatari petro-dollars are funding the regime change project in Syria, with the actual cash payroll distributed from Turkey by a Saudi official. America is the source of the regime change policy towards Syria, with Turkey as the logistical base of operations, and Syria is the battlefield, with unarmed Syrian civilians amounting to the largest number of casualties. Turkey is a modern democracy. It has long prided itself on its secular form of government. However, the AKP party, which is now the ruling party of Pres. Erdogan, is in fact an Islamist party. Pres. Erdogan has continually been making substantial changes to the social and political fabric of Turkey, in order to shift it towards Radical Islam. Radical Islam is not a religion, or sect, but a political ideology. The Muslim Brotherhood is a global political party which is based on Radical Islam. The Muslim Brotherhood is outlawed in many countries, notably Egypt and Syria. Pres. Erdogan is a supporter and defender of the Muslim Brotherhood. The Syrian armed opposition, FSA, has a political wing, Syrian National Coalition (SNC). Pres. Erdogan hosted the SNC in Istanbul, Turkey. America is also home to the Muslim Brotherhood, with offices and members in almost every big city across USA. The US Congress once debated outlawing the Muslim Brotherhood; however, it did not pass. Members of the Muslim Brotherhood hold high positions in Pres. Obama’s administration, and in key departments such as security and defense. In the United Kingdom, the Muslim Brotherhood is also throughout the country, and has established itself with close ties to the UK government. The same can be said of the Australian government scene. Saudi Arabia is home to the Wahhabi brand of Radical Islam, while Qatar promotes the Salafi brand of Radical Islam, and Turkey, USA and UK are bases for the Muslim Brotherhood brand of Radical Islam. These three brands are the three sides of the same coin. However, the vast majority of Muslims worldwide reject Radical Islam, and according to Islamic scholars, they reject the “Death Cult “called ISIS, which was born out of the three brands just described. Syria’s “Chinatown” is not a tourist spot, known for bright red paper lanterns and tasty noodle dishes. For that you will have to go to San Francisco, or Seattle. Syria’s “Chinatown” is a small village in the countryside, of rolling hills and olive orchards. Syria’s Chinatown is a terrorist town, not a tourist town. One day those Uygur ‘tourists’ to Syria will have out-stayed their VISA issued by Pres. Erdogan, and will face either death on the battlefield, or a slow walk Eastwards on the Old Silk Road their ancestors once made famous.